The Sentinel G2+ 3 x 50 rifle scope takes all the requirements for modern day hunting into account, Utilising a military-style design and offering maximum functionality, It is an obvious choice for anyone who demands the highest quality and reliability. 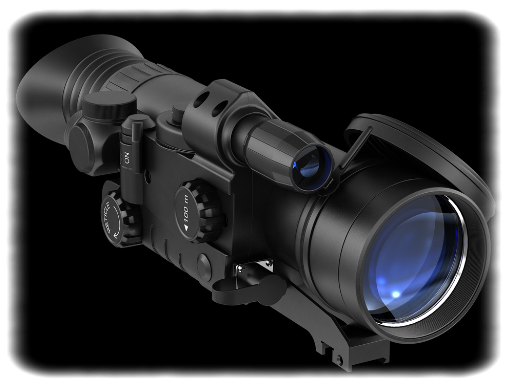 The Sentinel G2+ features optimal 3x magnification and has a high light gathering capacity. The Sentinel G2+ possesses a high impact resistance and can be mounted on a hunting gun of various calibres. The high aperture 50-mm objective lens with internal focusing allows a sharp picture at different distances. The Sentinel has a brightness control option and a range finding scale, The colour of the reticle can be changed by a simple push of a button. All main controls are on top of the body simplifying accessibility,there is also a remote control that can be positioned on the weapon. It is fully weatherproofed and thanks to a nitrogen purged optical channel it is waterproofed to IPX4. This is a promising recruit to the class of elite night vision scopes.